This year’s European Society of Cardiology (ESC) Congress took place in Amsterdam, The Netherlands, on 31st August – 4th September 2013. We report highlights from some of the hundreds of studies reporting including more on the cardiovascular effects of drugs for diabetes to the latest in intervention, the effects of anticoagulants in valve disease and new lipid lowering agents. Patients undergoing percutaneous coronary intervention (PCI) for ST-elevation myocardial infarction (STEMI) have better outcomes if non-culprit lesions are also treated, according to results from the PRAMI (Preventive Angioplasty in Myocardial Infarction Trial) study published recently in the New England Journal of Medicine (http://dx.doi.org/10.1056/NEJMoa1305520). In the trial, patients who also had PCI of the non-culprit lesions had a 65% reduction in event rate, driven by reductions in subsequent myocardial infarction (MI) and refractory angina. Presenting the results, Dr David Wald (Queen Mary University of London) said the benefit of preventive PCI of non-culprit lesions occurred early, within days, and the full benefit was maximised after a few months. The study involved 465 STEMI patients who underwent PCI of the infarct-related artery. Of these, 234 patients were randomised to PCI of non-culprit lesions and the other 231 patients received no further PCI treatment. The trial was stopped early after a significant benefit was seen favouring preventive PCI. After a mean follow-up of 23 months, the primary end point, defined as death from cardiac causes, nonfatal MI, or refractory angina, occurred in 21 patients treated with preventive PCI and 53 patients treated with PCI of the culprit lesion only. Dabigatran is not appropriate as an alternative to warfarin in the setting of mechanical heart valves, say results from the RE-ALIGN (Randomised, phase II study to Evaluate the Safety and Pharmacokinetics of Oral Dabigatran Etexilate in Patients After Heart Valve Replacement) trial. The European Medicines Agency issued a statement in December last year that dabigatran was contraindicated in mechanical heart valves as a result of an increase in strokes, myocardial infarction (MI), and thrombosis forming on the valves seen in RE-ALIGN. The full data, presented at the congress, showed that ischaemic or unspecified stroke occurred in 5% of the dabigatran patients versus 0% of the warfarin group, and major bleeding occurred in 4% of dabigatran patients versus 2% of warfarin patients. All patients with major bleeding had pericardial bleeding. Asymptomatic valve thrombosis was detected in 3% of the dabigatran group versus 0% of those on warfarin. The investigators concluded that the different mechanism of thrombosis in patients with mechanical heart valves, as compared to patients with atrial fibrillation (AF), may explain the failure of dabigatran in RE-ALIGN. The study was published online in the New England Journal of Medicine (http://dx.doi.org/10.1056/NEJMoa1300615). In an accompanying editorial (http://dx.doi.org/10.1056/NEJMe1310399), Dr Elaine M Hylek (Boston University School of Medicine, USA) suggested several reasons for the failure of dabigatran in this setting. These include the fact that most patients received dabigatran early after surgery, when thrombogenicity is enhanced, the dose may not have been appropriate for this population, and the drug may not have been absorbed as well as expected. Because of these possibilities, she says further research in this field should be continued. While clopidogrel is recommended for preloading, prasugrel has a more rapid onset of action and these results suggest early treatment is not necessary and could be harmful. ACCOAST was designed to randomise 4,100 patients to an early or standard strategy. The trial was stopped after enrollment of 4,033 patients last November because of an increase in major and life-threatening bleeding and no reduction in cardiovascular events. The primary efficacy end point (a composite of cardiovascular death, myocardial infarction (MI), stroke, urgent revascularisation, or glycoprotein IIb/IIIa bailout) was not significantly different between the two treatment groups at seven or 30 days. 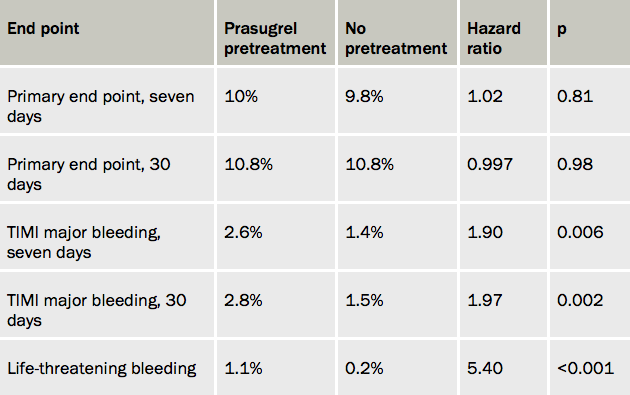 However, bleeding measures were significantly higher in the pretreatment group (see table 1). The study was published in New England Journal of Medicine (http://dx.doi.org/10.1056/NEJMoa1308075). The overall impact of stopping dual antiplatelet therapy is modest and may have been mitigated with the introduction of safer stent platforms. This was the conclusion of Dr Roxana Mehran (Mount Sinai Medical School, New York, USA) presenting results from the PARIS (Patterns of non-Adherence to anti-platelet Regimens In Stented patients) study. The results did suggest different effects of stopping dual antiplatelet therapy in different situations, she noted. “When physicians recommend discontinuation, presumably because patients are stable, there is no risk of adverse events, but when patients simply don’t comply or are forced off antiplatelet therapy because they are bleeding, their risks are significantly elevated”. She added that these results highlight the need for potentially tailoring guidance of antiplatelet therapy cessation to the different categories. The PARIS study enrolled more than 5,000 patients following stent implantation. “Discontinuation” was defined as physician-recommended cessation, “interruption” was a temporary stop (up to 14 days) due to surgical necessity, and “disruption” was unplanned cessation, due to bleeding or patient noncompliance. The majority (74%) of cardiac events in the trial occurred when patients were actually taking dual antiplatelet therapy (DAPT). In patients who had disrupted therapy, the risk was highest in the first seven days (hazard ratio 7.04, compared with remaining on therapy, p<0.001) and continued out to 30 days. Stent thrombosis most commonly occurred in patients still taking their medication (80.3% of the events) but was also seen in 14.1% of patients with disrupted therapy. Numbers were negligible in patients with recommended discontinuation or interruption. Dr Mehran noted that the hazard was much greater if both drugs were stopped, so she advised that if there was a bleeding concern that only one of the drugs was stopped. She added that she would voluntarily discontinue both drugs in patients at higher risk for bleeding complications after the highest risk period was over – usually three to six months post-percutaneous coronary intervention with the newer generation of drug eluting stents. Mechanical chest compression with an automated system device (Lucas™, Jolife AB) was not more effective than manual compressions for delivering cardiopulmonary resuscitation (CPR) to patients in cardiac arrest, according to results from the LINC (LUCAS in Cardiac Arrest) study. Presenting the results, Dr Sten Rubertsson (Uppsala University Hospital, Sweden) said the fact that the mechanical device was equally effective and showed no safety concerns meant there was now scientific data to support its use. He added that there was only one patient out of 111 treated with the mechanical device who was left with a bad neurological outcome (clinical performance category score of three or four) compared with six of 104 patients given manual compressions. The LINC study included 2,589 patients from six European sites who had suffered an out-of-hospital cardiac arrest. Manual chest compressions were started on all patients as soon as paramedics arrived on the scene. Patients were then randomised to be kept on manual chest compressions or be switched to mechanical compressions with defibrillation during ongoing chest compressions. Results showed that four hours after the start of CPR, survival rates were similar in both groups. Later outcomes were also similar, including the rate of restoration of spontaneous circulation (ROSC), the number of patients who arrived at the emergency room with a palpable pulse, the number of patients who survived until discharge from intensive care, and neurological outcomes at one and six months. Two oral antihyperglycaemic agents – saxagliptin and alogliptin – did not increase or decrease the risk of major cardiovascular events in patients with type 2 diabetes mellitus according to the SAVOR (Saxagliptin Assessment of Vascular Outcomes Recorded in Patients with Diabetes Mellitus) -TIMI 53 and EXAMINE (Cardiovascular Outcomes Study of Alogliptin in Subjects With Type 2 Diabetes and Acute Coronary Syndrome) studies respectively. Saxagliptin, however, was associated with a significant increased risk of hospitalisations for heart failure, a component of the pre-specified secondary end point in SAVOR-TIMI 53. Secondary end points have not yet been analysed in EXAMINE. While saxagliptin and alogliptin significantly reduced glycated haemoglobin levels, there was some debate about the role of the drugs, which are dipeptidyl peptidase-4 (DPP-4) inhibitors, in clinical practice. Noting that metformin is widely regarded as first-line therapy for patients with diabetes, EXAMINE investigator Dr William White (University of Connecticut School of Medicine, USA) suggested these latest results, which support lack of a safety signal in a very high-risk population, gave enhanced credibility to use a DPP-4 inhibitor as a second drug in addition to metformin. He pointed out that these agents lower the glycaemic index significantly, and therefore should reduce the risk of microvascular complications. In SAVOR-TIMI 53, 16,492 patients with type 2 diabetes with a high risk of cardiovascular events were randomised to saxagliptin 5 mg/day or placebo. After a median of 2.1 years, the primary end point — a composite of cardiovascular death, myocardial infarction (MI), or ischaemic stroke — had occurred in 613 patients treated with saxagliptin and 609 patients treated with placebo. Glycated haemoglobin levels were reduced from 8.0% at baseline to 7.7% with saxagliptin, a significant reduction versus placebo. In the EXAMINE trial, 5,380 patients with diabetes and acute MI/unstable angina were randomised to alogliptin or placebo. The primary end point of the trial – a composite of cardiovascular death, nonfatal MI, and nonfatal stroke – were similar in the two groups, and glycated haemoglobin levels were significantly reduced by -0.36%. The studies were published in the New England Journal of Medicine (http://dx.doi.org/10.1056/NEJMoa1307684 and http://dx.doi.org/10.1056/NEJMoa1305889). An accompanying editorial (http://dx.doi.org/10.1056/NEJMp1309610) makes the point that the optimal approach for reducing cardiovascular risk in diabetic patients is the aggressive management of cardiovascular disease risk factors rather than aggressive glycaemic control. A new oral drug that boosts production of the high-density lipoprotein (HDL) precursor protein apoA1 did not produce significant regression of atherosclerosis in the ASSURE (ApoA-I Synthesis Stimulation and Intravascular Ultrasound for Coronary Atheroma Regression Evaluation) study. The study included 323 patients with low HDL and coronary disease. All patients received statins and were also randomised to receive either RVX-208 100 mg (n=244) or placebo (n=80) twice daily for 26 weeks. Atherosclerosis was assessed by intravascular ultrasound (IVUS) at baseline and the end of the study. Both groups showed increases in HDL and reductions in low-density lipoprotein (LDL), as well as trends toward a regression of atherosclerosis. Presenting the results with RVX-208, Dr Stephen Nicholls (Royal Adelaide Hospital, Australia) noted that a large placebo effect led to no significant difference in HDL changes between the active treatment and placebo groups, so this study had not addressed the HDL hypothesis. The primary end point of the study – change from baseline in percent atheroma volume – just failed to meet significance in the RVX-208 group at six months, and it was suggested that longer treatment may be needed to show an effect. The renin-inhibitor aliskiren had no effect on atherosclerosis progression in patients with coronary disease and prehypertension, according to results from AQUARIUS (Aliskerin QUantitative Atherosclerosis. Regression Intravascular Ultrasound Study). The drug was tested in this intravascular ultrasound (IVUS) study after atheroprotective effects with renin inhibition were observed in preclinical studies. For the study, 458 patients were randomised to aliskiren or placebo and underwent IVUS screening at baseline and again after at least 72 weeks. Results showed that percent atheroma volume decreased slightly in both groups (-0.33% with aliskiren versus -0.24% with placebo), a non-significant difference. Acute coronary syndrome (ACS) can be ruled out with negative results from two simple tests – troponin and co-peptin – allowing the majority of individuals to be discharged quickly and easing overcrowding in the emergency department, a new study suggests. Presenting the results of the BIC-8 (Effect of the Biomarker Copeptin in Managing Patients With Suspected Acute Coronary Syndrome) trial, Dr Martin Möckel (Charité-Universitätsmedizin Berlin, Germany) noted that 10% of patients in the emergency department present with chest pain, but only 10% of those patients are having a real ACS event. Co-peptin is a marker of severe haemodynamic stress and is detectable immediately in patients with ACS. In observational studies, a combination of cardiac troponin and co-peptin was shown to be a significant predictor of acute events, Dr Möckel explained. In the BIC-8 study, 902 patients at low to intermediate risk of ACS and an initial negative troponin test, were randomised to co-peptin test or standard care, including serial cardiac troponin testing. If the co-peptin test was positive, defined as >10 pmol/L, they were treated with standard ACS care. If the co-peptin assay was negative, they were discharged and scheduled for an outpatient visit within 72 hours. At 30 days, the rate of major adverse cardiovascular events was almost identical – 5.46% in those undergoing co-peptin testing and 5.5% in the standard-care arm. The discharge rate from the emergency department was 66% in the co-peptin group versus 12% in those given standard care. Only certain groups in most countries actually experience blood-pressure benefits from restricting their sodium intake, and the guidelines need to be changed to target sodium restrictions to vulnerable groups such as hypertensive subjects and the elderly, new results from the PURE (Prospective Urban Rural Epidemiological) study suggest. Presenting PURE results (table 1), Dr Andrew Mente (McMaster University, Hamilton, Canada) said that whole population recommendations for daily sodium limits are pointless in many parts of the world. In the study of almost 100,000 subjects, none of the populations surveyed had a usual intake of sodium below the 2.3 g/day recommended in most guidelines. Intakes were lowest in Malay; ranged from 4.2–4.8 g/day in North America, Europe, South Asia, Africa, and South America; and were highest in China at more than 5.5 mg/day. And while there was a linear relationship between sodium levels and blood pressure, meaningful systolic blood pressure changes in response to 1 g increases in sodium consumption were only seen in certain groups – hypertensive subjects, the elderly, and people consuming more than 5 g/day of sodium. Dr Mente said: “For those in the 3–5 g/day range, there is little benefit of reducing levels apart from in those vulnerable groups, so in most countries, strategies to reduce blood pressure via sodium restriction are best targeted specifically at those groups. Whereas in China where intakes are higher, a population strategy appears more reasonable”. Statins linked to reduced dementia? A new observational study from Taiwan suggested that high-dose statins may be linked to a reduced risk of dementia in the elderly. The researchers used Taiwan’s national health insurance data to identify 58,000 individuals over 65 years who had no history of dementia in 1997 and 1998. Of these, 15,200 were taking statins. Propensity scoring was used to match these patients with controls not taking statins. There were 5,516 new diagnoses of dementia during the 4.5 years of follow-up. 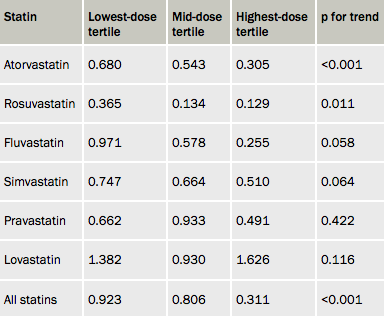 Results showed a dose-related inverse relationship between statin use and new-onset nonvascular dementia (see table 1). Statins and dementia is a controversial area, with previous studies having shown conflicting results. Two randomised trials – PROSPER (Pravastatin in elderly individuals at risk of vascular disease) with pravastatin in the elderly and the LEADe (Lipitor’s Effect in Alzheimer’s Dementia) study with atorvastatin in early Alzheimer’s patients – have not shown any benefit of statins on risk of dementia. Possible cognitive impairment has recently been added to the safety information for statins in the US, the study concluded. Cangrelor is indeed effective for the reduction of periprocedural thrombotic complications during percutaneous coronary intervention (PCI) compared with placebo or clopidogrel, at the expense of an increase in minor bleeding, according to a pooled analysis of three trials with the new IV antiplatelet. Presenting the data (see table 1), Dr Christian Hamm (Kerckhoff Heart and Thorax Centre, Germany) explained that the pre-specified patient-level analysis combines data from CHAMPION-PCI, CHAMPION-PLATFORM, and CHAMPION-PHOENIX studies in a total of 25,000 patients with ST-elevation myocardial infarction (STEMI), without STEMI, and with stable coronary disease, all undergoing PCI. The primary outcome – a combination of death, MI, ischaemia-driven revascularisation, or stent thrombosis at 48 hours – was significantly lower in the cangrelor group. Stent thrombosis was also reduced in the cangrelor group. The primary safety outcome – non-coronary artery bypass graft (CABG)-related Global Use of Strategies to Open Occluded Arteries (GUSTO) moderate bleeding or transfusions – was not significantly different between the groups. GUSTO mild bleeding was higher with cangrelor. The analysis was published recently in The Lancet (http://dx.doi.org/10.1016/S0140-6736(13)61615-3). In an accompanying editorial (http://dx.doi.org/10.1016/S0140-6736(13)61840-1), Dr Shamir Mehta (McMaster University, Hamilton, Canada) points out that two of the three trials did not show significant results on their own, but that benefit has been achieved in the meta-analysis. Dr Mehta notes that cangrelor, which is given by intravenous injection, produces almost-immediate platelet inhibition, and has a very short biological half-life of three to six minutes, with normalisation of platelet function within one hour of discontinuation. He suggests the drug could have a major role in high-risk STEMI, patients with nausea/vomiting, intubated patients, and those in cardiogenic shock. Dr Anselm Kai Gitt (Herzzentrum Ludwigshafen, Germany) presented a subanalysis of DYSIS (Dyslipidemia International Study), which examined the possible impact of reimbursement systems on the achievement of low-density lipoprotein (LDL)-cholesterol targets in 4,260 German patients and 540 UK patients at high cardiovascular risk. The aim was to compare the German system, which restricts chronic medical treatment by budget constraints, with the UK’s incentive system where GPs receive payment linked to achieving cholesterol targets. All patients in the study were taking statins, but 42% of German patients achieved the target of LDL <100mg/dl (< 5.5 mmol/L) compared to 79.8% of UK patients. The potent statin, atorvastatin, was used in 3.9% of German patients (mean dose 24 mg) compared to 24.8% of UK patients (mean dose 34.2 mg), whereas the weaker statin, simvastatin, used in 83.9% of Germans (mean dose 27.2 mg) compared to 67.6% of UK patients (mean dose 36.6 mg). Daily dosages were significantly lower in Germany than in the UK, independent of the statin used.